Finding the perfect gift for the man you love can be challenging if you want to make an impact on his birthday. We won’t make it hard there’s a good number of different things that he won’t already have, and you’ll be confident knowing that your gift will be one of a kind. Below we’ll take a look at some of the best gifts that any guy could enjoy for his birthday, and your bank account won’t have to suffer as a result. Continue reading down below to find out just what made our list of best birthday gifts that you can give to your significant other. Our ratings are based on what customers said about each product in the category provided, as well as how functional each item is. If your guy likes to work on things around the house and have a large assortment of tools, then these gifts will be great options to help him out on all of his projects. You’ll find that all the products listed below are great for their versatility and convenience in use. There's nothing more frustrating than going to grab a screw or bolt, and you knock it to the floor by accident. Instead of putting him h through this frustration, a great gift would be this magnetic wristband made by MagBand. And anything that can be held by a magnet. The fit is comfortable thanks to the breathable material that’s used, and it doesn’t sacrifice durability to make it comfortable. This item is currently on Amazon for $$ and is eligible for Prime shipping if you are a member. This is a silent rachet will be a great addition to any guy’s toolbox. It’s versatile and gives no backlash when using it. This is an excellent tool for both advanced DIYers as well as less experienced ones. You will have access to fifteen different attachments on seven different double-ended bits. This rachet design features durable S2 steel for the main body, and it comes with its bit storage built into the handle. This feature makes it a convenient tool that won't force its user to search for missing or lose bits in a large toolbox. 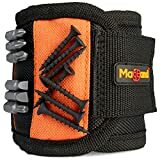 He will be able to take on any project with ease, and for only $$ on Amazon, it’s a great gift for his birthday. This is one of the more expensive items on this section of our list, but for what it does, we agree your guy will love to have one. 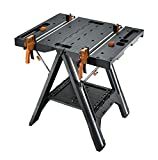 This workstation will provide your guy a satisfactory area to set down tools, and it even doubles as a sawhorse. You’ll get two 18-inch quick-clamps and four table slots in case you’re working with different sized projects. Overall, the table can hold up to 300 pounds while the sawhorse can take on up to 1,000 pounds no problem. It’s small enough to be stored away easily and light enough to be carried and set up wherever needed. It's going price is currently $$ on Amazon. If your guy likes to go out and perfect his swing on a regular basis, then these great gifts for the golfers in your life would make wonderful birthday gifts. As before, we’ll find unique gift ideas that won’t cost an exorbitant amount of money to get for them, and it will be something that he’ll be able to use again and again. 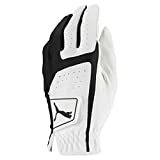 This is a beautiful, comfortable glove for experienced and new golfers alike. This glove comes fashioned from an advanced synthetic leather which combines with four-way stretch lycra. This glove also comes in three colors, ranging from the standard blue to black and finally to grey. You can order the glove to fit on the right or left hand, engineered with a stay grip palm design which helps keep the perfect grip on the club before that ideal shot is taken. A velcro tab allows the glove to fit securely on its wearer's hand and the ventilation on the gloves themselves help prevent hand sweating on hot days. This glove is relatively cheap too. You can purchase just the one glove starting at $$ on Amazon. However, changes in size and availability will alter this amount. What’s behind a good game of golf? The swing and the type of ball you use after all. 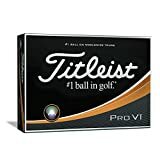 Even if you’re not familiar with the game itself and you leave it all for him to enjoy, these golf balls are designed to take his game to the next level. Their design gives golfers an even longer distance for all of their shots thanks to lower long game spin. It's designed also allows for a more consistent flight for golfers who like accuracy in their plays. Players who use this ball will have the advantage of the patented Drop-and-Stop greenside control which gives less roll and more power in the game. These Pro V1 balls are currently going for $$, and you get a dozen in each pack you purchase. Isn’t it great to live in a time where technology can help us test our limits and go beyond them? This device is like the Fitbit to the golfing world. If he likes to get into the logistics and take a comprehensive look at his swing while being provided with tips and tricks to improve further, then this device would be the perfect birthday gift for him. On top of all that, the device's app will take the data that he had recorded in his last game and analyze it to point out where improvements could be made. Smart Coach will eliminate any guesswork and will give him the best advice on how to improve his game for next time. Better yet, he can share his progress with whoever he wants. Currently, you can find the Zepp Golf 2 3D Swing Analyzer on Amazon for $$. While it’s a bit pricier than the other items in this category, the features packed into this little device makes the price tag more reasonable. Is he more excited for the start of football season than he is for turkey dinner on Thanksgiving? Can he name all of his favorite players of his favorite teams? If your guy is a sports enthusiast, then we’ve got a great list of gifts that he’ll enjoy. If he likes to have the guys over for the game, then pub glasses with his favorite team etched on the front would be an excellent gift. Most places have different designs and styles dependant on your guy’s personal preferences. You can have your glasses painted with his favorite team, or the team's design etched into the glass. Football, Baseball, and Basketball teams are some of the more popular types to order, and there are special deals if you order more than one at a time. For the man in your life that likes to dress up but still show support for his team, these sport-shaped cufflinks might be right up his alley, and they’re relatively inexpensive. 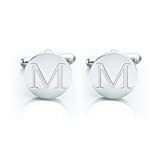 Cufflinks can come in a variety of different material options such as sterling silver or gold if you want to pay more for them and of course, you can buy cufflinks designed around the sport that he most enjoys. Sports fans took it to the next level beyond shaped cufflinks and designed pairs that had pieces of each sport featured in them. An example would be a pair of cufflinks that feature a part of a football that was used to make the winning goal in the last super bowl, or cufflinks that had a slat of wood from a bad that scored a home run. Not only would these pieces be unique, but your gift will also be treasured for years to come knowing that he wore a part of sports history at his cuffs. Fleece throw blankets are the best for cuddling under while watching a movie or just being near each other. This is a great gift to share or to give him to chill under while he’s watching the game when it’s colder. You can usually find a blanket that fits his desired team without much hassle. Most of the official NFL websites and Amazon will have them in stock and available all year round. These blankets are warm and soft, and because of their design, it could be an excellent way to accentuate his living area. Whether they enjoy good beats or they enjoy constructing a musical masterpiece, there are many different gifts that will make his heart sing. These are some of the top gifts that really speak to the virtuoso in your family and will guarantee to be used in years to come. Three-speed turntable (33 1/3, 45, 78 RPM) plays all of your vinyl records and favorite albums. Built-in Bluetooth to wirelessly play music from your Bluetooth enabled device. No cords needed. Who doesn’t love putting vinyl on and listening to music that brings you a sense of nostalgia? Portable turntables are the perfect gift for those music lovers who collect old and new vinyl and enjoy bringing that with them wherever they go. 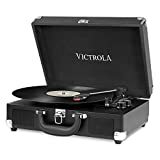 The Victrola Vintage turntable comes with three speeds and has Bluetooth capabilities, so he can utilize any Bluetooth speakers he may have available. Its portable suitcase design makes it easy to carry around, and it’s built to be durable for long trips. 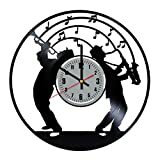 What better of a gift for someone who loves music than a clock that’s made out of a record. These clocks are all beautifully handcrafted that comes with a lovely design and a quote on the lower end of the clock. They can come in a large variety of designs, but they’re all sized at 30 centimeters or twelve inches in diameter. The clock is silent, and it takes an AA battery to operate. These clocks are available for purchase from Amazon for only $$. This is a sure way to make your gift especially treasured. 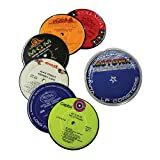 They may seem like just standard coasters for your coffee table, but these were upcycled from actual vintage vinyl records. Every purchase comes with six coasters from all sorts of bands, music, and artists so you’ll get a good mix that he can enjoy. Currently, there are no options available for specific bands or albums to be customized for the order, what you get will be a surprise. They are four inches across so they’ll accommodate most glass sizes and they only cost $$ for the set. Not all guys fit into these classifications, but that’s ok. These gifts are great for just about any kind of guy out there. There will be something that he’s likely to enjoy. 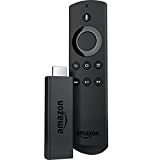 Quality cuddling time or just catching the latest action flick with his friends will be possible with all of the movies and streaming services available through the Amazon Fire Stick. What looks like a little USB drive for your tv attaches to an HDMI port on the side and uses your WiFi to stream internet services to it. With this gift, he’ll have access to over 500,000 movies and tv shows, and he’ll be able to utilize streaming services like Hulu, YouTube, Amazon Video and you’ll be able to check out Facebook and Reddit threads too. This little gift only costs $$ at Amazon, and it’s guaranteed to be a gift that you both can enjoy. It’s not a great birthday party without an awesome cocktail shaker to dish out some excellent drinks. The Rabbit cocktail shaker is made with stainless steel and features tightly locked insulation to keep the contents of your shaker secure and cool. It’s small enough to take around where needed, but it’s robust to take on large amounts of orders so no one will go thirsty. It could be the gift that keeps the party rolling well into the night. The number one thing that should be a consideration before you purchase a product as a gift is the durability of each product. You’ll want your gift to last as much as you want it to be memorable, especially for an event as necessary as a birthday present. All of these products met the durability factor while also remaining unique to each one's tastes and would make excellent gifts for a remarkable man in your life.